Greetings on this Friday. Welcome to our tour stop on the It Started With A Whisper Blog Tour presented by Goddess Fish Promotions. Wishes are powerful things, if you belong to the MacClarity clan. You can ask Ernest for anything and he’ll make it come true, even though he’s been dead for nearly a hundred years. Puppy MacClarity doesn’t take the rumors about Ernest too seriously. But when he’s had enough of his teacher’s harassment, Puppy asks Ernest to take care of Miss Pritchett for him. Ernest does and family secrets start to surface like magic. During a summer filled with both fear and fun, Puppy begins to realize that Ernest isn’t the only special thing about his family, and their oddities aren’t just skin deep. Too bad he didn’t know sooner. Mom cut my hair at the beginning of every summer with a pair of rusty old clippers, once used on a poodle named Ragamuffin. She didn’t see anything wrong with that, even though the clippers cut odd furrows and missed some of my hair altogether. I stretched out across the kitchen island between flour sacks and stacks of well-worn pots, shivering as the small strip of skin between my uniform shirt and pants touched the frigid zinc countertop. There was no escape. When I was younger, I tried running away, or hiding in the storage closet with the rest of the family’s odds and ends, but Mom always found me in three minutes flat. I think she had a secret weapon, it might’ve been Ernest, but I was never sure. “I’m too old for this,” I said. Mom didn’t look at me, but continued to search through a drawer filled with rusty egg beaters, broken crayons, and bits of jagged scrap metal. “You’re not too old for anything until I say you are,” she said. Then she discovered the clippers in the back of a drawer with dog hairs still sticking out of the blade and pulled me upright. She switched it on with a look of triumph and my curls rained down around me, sticking to my sweaty arms and tickling my neck. After Mom finished, I ran my hand over my head. Spiny hair pricked my fingers and I sighed. It wasn’t so bad. If I could stand being called Puppy, I could stand anything. My real name was Ernest and that was worse. Mom nicknamed me Puppy when she was potty-training me, because I kept peeing all over the house. She loved telling everybody the origin of my name, so the hair wasn’t so bad in comparison. A.W. 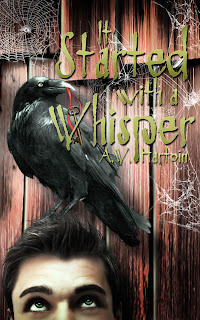 Hartoin is the author of the Mercy Watts mystery series and the Away From Whipplethorn fantasy series. She lives in Colorado with her husband, two children, and six bad chickens. Hi, Caity here. 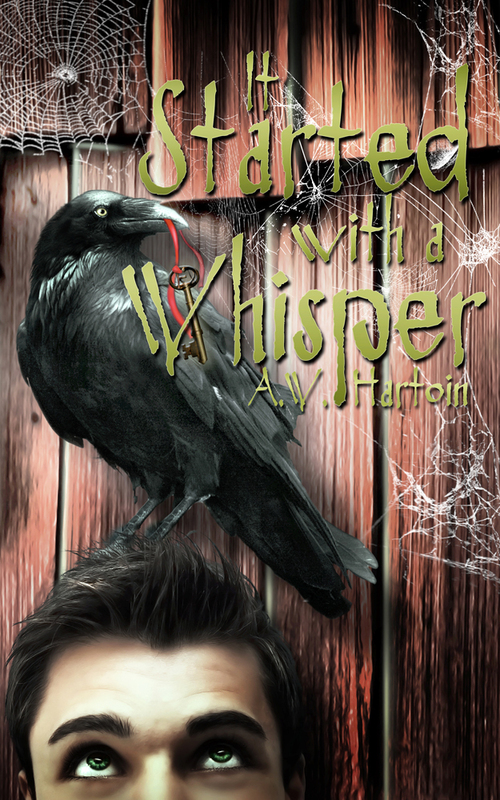 I really liked reading It Started With A Whisper by A. W. Hartoin. The story, characters, and pretty much everything else was different from much of the books I read. Very offbeat, refreshingly so, funny, and yet serious at times, I don't think I'll be forgetting these characters for a long time. The main character is a teen boy named Puppy. Yeah, I thought why call him that but he explains his nickname and then I liked the name. His real name is Ernest, named after his grandfather, the Ernest mentioned in the summary. Calling him Puppy differentiated him from his namesake and helped establish his identity. Puppy is a nice guy, he deals with the issues so many of us teens have to and he has a teacher who hates him. He asks Ernest to help him with this problem teacher and that's when I realized this was going to be one of those "special" stories. The author weaves contemporary issues with a magical, lovable dysfunctional family, and it was all engrossing. There are lots of twins in Puppy's extended family, his mom and Aunt, his cousins, and what a zany bunch they were. They spend the summer at this "camp" which is like a hideaway vacation home complete with woods, a lake, and a list of visiting friends. There's music too, which I really loved, and such an offbeat feel I found honest and refreshing. I also liked the author's writing. By using just the right amount of words, she told the story without bogging the reader down. I zoomed through easily and discovered a new author to definitely check out and hope she makes this a series. I don't want to spoil the magic of It Started With A Whisper so I'll just say this book will weave a spell around the reader. Puppy is a really good character who rises above the fun and chaos around him when he is needed and in the process grows up into an admirable young man. I don't think I'll regard elephants and incense in the same way anymore. Love it! Very funny and conveys the cool, zany vibe of the story. I received a promotional copy in return for my honest review. A. W. will be awarding a $10 Amazon GC to a randomly drawn commenter during the tour. Follow the tour and comment to increase your chances of winning. I do love the humor. Always to be encouraged in stories. That is such a great cover! I would have liked to read a couple of other, different excerpts during the tour, but I think it sounds like a fun, quirky read. Thank you for such a great review. I'm glad you enjoyed reading Whisper. Great review, I'm looking forward to reading the story. Great review! I'm looking forward to read this book! Do you like to listen to music while you are writing? Hi, A.W.! 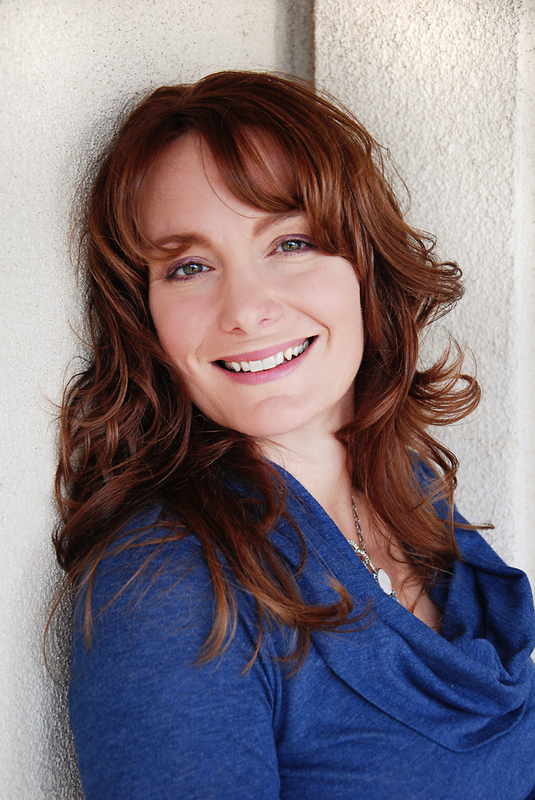 I just loved following along on your blog tour! :-) I'm super excited to check out It Started with a Whisper! I'm lovin' all the good things everyone's had to say about it!